You are an embodiment of abilities and talents. Every potential is there with in you. Realize it and move forward. The school and teachers just facilitate the development of your capabilities. They do not add anything new instead they provide you with an environment where you can grow up to the fullest potential. A good school like Bhavans provides opportunities to the students for self-development. 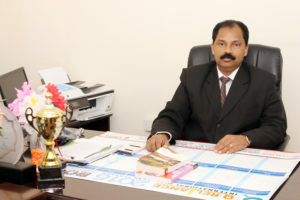 Bhavans does not set limit to its students for growth and development. Our School wants all the students to expand their mental horizons to the maximum possible extent. Evaluation of performance or grading is also a tool for self-development. This is not for comparison. You are Unique and there is no one exactly same as you, so are your capabilities too. Competitive spirit is good for growth and for achieving goals. One should compete with oneself and not with others for a healthy social and personal life. Self-improvement is the crux of a healthy competition. You are going to be citizens of tomorrow rather world citizens of the globe. So learn to expand your mental horizon to accommodate changes, assimilate new ideas and disseminate your views without losing your identity. I would like to borrow a few words of famous writer Rabindranath Tagore to conclude,“”Where the mind is without fear and the head is held high, Where knowledge is free, In to that heaven of freedom”” Let the students of Bhavans awake. Education is an eye opener to move from darkness to light. We, at Bhavans believe in schooling beyond their school years and assisting them to become lifelong learners, as well as helping them to be self-directed, realistic, and responsible decision makers. The activity based learning based on Continuous Comprehensive Evaluation (CCE) method introduced by the CBSE train students in problem solving and decision making. This will help them to face all challenges that at they will encounter in our multicultural and ever-changing world. I am strongly convinced that education of the children is a collaborative effort of the parents, teachers and students. Undoubtedly, parents do have a pivotal role in imparting knowledge,shaping their minds and inculcating values. Profound support and cooperation of parents is a prerequisite for good education and development of students at any school. The ever encompassing role of a mentor or a teacher is undeniable and individual care and concern of highest quality for your ward is ensured at Bhavans. Let’s join hands together to undertake this commendable mission of educating the young minds. The beautiful portals of our campuses are thrown open to your wards to explore and discover the scintillating world of fun filled learning and a jovial journey called life! We train students for life and examinations are only rehearsals to face the real challenges of life.